I sit outside chalet number 21 (http://www.fundyhighlandchalets.com/) looking down the hill towards the Bay of Fundy. Across the Bay I can see Cape Chignecto (http://www.novascotiaparks.ca/parks/capechignecto.asp) and its massive red rock cliff line. Much closer I can see a gleaming birch tree as the sun is reflecting off its white bark just right to make it seem almost angelic. To my left and down the hill away I can hear children and adults laughing. The clink clank of a washer game going on is to my right further down the hill. All around me birds are chirping but mainly the white throated sparrow as it calls out “Cheeeezeeburger, burger, burger, burger. With all this distraction I still think I can even hear the white, fluffy topped, clouds moving. It is one of those moments where you feel like you stepped back in time. The cozy chalets are old looking, yet well maintained. The camaraderie I hear, seldom exists in local neighborhoods anymore. 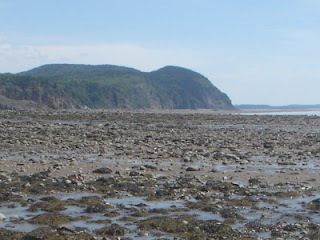 So what is it about Fundy National Park (http://www.pc.gc.ca/pn-np/nb/fundy/index_e.asp) that takes me back in time? I think, for me, it is because when I am here I tend to slow the pace down. I no longer feel the need to rush through things. Even as I golfed an horrendous 18holes of golf today I felt as if I was moving in slow motion. I admit this is not my usual style of vacation, but now with a family, I find that these gatherings are just as much a step back in time as my backpacking trips. Maybe it is because they take me back to when I was a kid and we always got together with Aunts, Uncles, cousins, and grand parents, and everyone shared in games and lots of laughter. Being so close to Fundy National Park just provides us with the idyllic setting for all these memories to be formed. We played with the kids at the big playground near the golf course earlier tonight and every kid there had a big smile on their face, even when they fell hard into the sand, off the zip line, they came up smiling. Every adult acknowledge one another and had no issues or worries in their eyes and laughed easier as their child did or said something funny. In reality I think I was watching my life take another step towards fulfillment, a step towards what I always wanted, a step towards being more like my parents. This filled me with a sense of pride and so maybe it wasn’t everyone else. Maybe it was just that I was in one of those moods where nothing could ruin it, not even the sand in my sandals as I pushed my son across the zip line for the 59th time. Earlier in the day my wife, son, and I made time just for us and spent it exploring Cannontown Beach. The tide was nearly in and so it made for a great lesson for my son on how the tide moves in and out. He screeched with laughter as the cold Bay of Fundy Waters swept up over his toes while my wife and I laughed at him. We both wished we could be so easily entertained. Earlier still, my son and I, along with my brother-in-law and his daughter, went for a canoe trip on Bennett Lake. It was another lesson in nature for Seth. The two kids showed great patients as their fathers paddled clumsily over the water. They each took turns paddling and splashing the water. 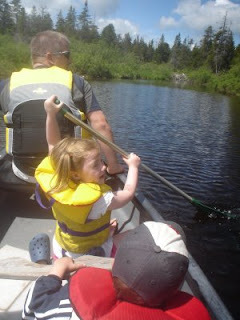 There were loons, ducks, beavers, tadpoles, and some fish and the kids took it all in with big smiles. Needless to say, everyone slept great at the end of the day. I hope your family gets a chance to get away this summer. Enjoy.